I’ve never consciously listened to Escape The Fate until about three hours before attending this show. My buddy Royce and I arrived around 10, a few minutes before ETF took the stage. We were two of maybe 30 people without Xs on our hands; the crowd was a young one, and we both felt a bit out of place. I honestly wasn’t expecting much. To my delight I walked away surprised. Young crowds are fun crowds. 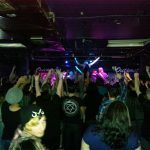 The members of Escape The Fate interacted with the audience so much, I don’t think they could have thrown more gratitude toward their adoring fans if they tried. Unusual for us, Royce and I watched from the back of the venue instead of the front. 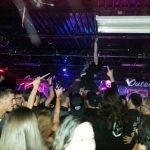 I wish The Outpost had an upstairs so I could have watched all the mosh pits from above. 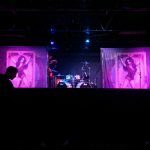 I didn’t get there early enough to see American Wolves or Get Scared, but all three bands on the Highway To Hell Yeah Tour are comprised of super nice, sweet people who were taking questions, allowing photos and handing out free stuff in the merch booth after the show. 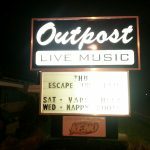 The Outpost was the last stop on this tour, but did headliner Escape The Fate show any signs of wear and tear? A big fat highway to hell no way.